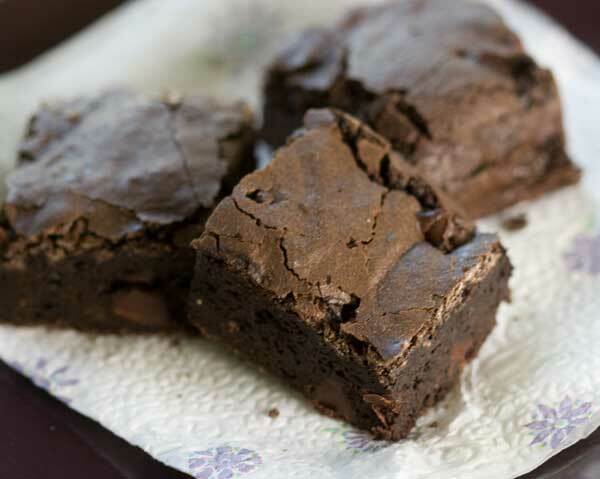 This is a recipe I make when I want a brownie that’s very chocolaty, but less greasy. It’s not a fat free brownie, but according to the nutrition software I use, the fat comes in at about 29% per serving, which is lower than in some other recipes. So there’s that, plus I like the texture. The reduced fat brownies aren’t mushy or soft like fat free brownies, but rather dense, thick and very chewy. There’s a little bit of butter flavor missing since you only use a tablespoon, but the chocolate flavor really comes through. Grapeseed oil works very well. I have this theory that because it’s a little more viscous it locks in moisture, but I really don’t know. These would probably work well with coconut oil or any kind of vegetable oil, but I feel like the best results were with the grapeseed oil. I’ve made these a few times over the past few years trying to get the texture just right, and when I finally got it the way I wanted it, I asked Katrina to test the recipe as well You can see her photos and opinions on Baking and Boys. Brownies with a little less fat than usual. Preheat oven to 350 degrees F. Line an 8 inch metal pan (do not use glass) with nonstick foil. In a saucepan, melt the butter over medium heat. Add the chocolate, remove pan from heat and stir until chocolate melts in the hot butter. If residual heat doesn't melt the chocolate enough, put the pan back on low. Stir the grapeseed oil into the melted chocolate, then stir in the cocoa. The mixture will look like thick, black, mud. In a mixing bowl, whisk the eggs, egg white, sugar and vanilla. Whisk in the baking powder and the salt, then scrape into thick chocolate mixture and stir well. Stir in the flour. When well mixed, stir in the chocolate chips. Bake on center rack for 30 minutes or until brownies appear set. Let cool completely on a rack. Lift from pan and slice into squares or for a cleaner cut, chill for a few hours and then cut. I always chill mine before cutting, then serve at room temperature. If you want a smaller batch, halve the recipe and bake in an 8 1/2 by 4 1/2 inch metal loaf pan lined with nonstick foil. For a half batch, you'll use 1 whole egg plus half an egg white. Halving an egg white is awkward. I just crack a whole into a bowl and spoon out what I feel is *about* half a white. It doesn't have to be precise. And using 1 egg and 1 whole white probably wouldn't wreck the recipe, but I like sticking with the proportions so I go ahead and halve the egg white. Thanks for posting these. Brownies have also been on my mind lately. I’ve been working so much lately that I haven’t been logging on as much as usual. If I had logged on more regularly you could have helped me with my craving for both oatmeal cookies and brownies!! I may have to order some butter flavored grapeseed oil, now! I have never baked with grapeseed oil. I will have to give it a try! Yum! I love the texture, and chewiness and flavor. I think I’ll make them again for the baby shower. They were easy, too! Thanks for letting me play along!